Hymenoptera Venom extracts may potentially elicit a severe life-threatening systemic reaction, rarely resulting in death. (1) Therefore, emergency measures and personnel trained in their use must be available immediately in the event of such a reaction. Patients should be instructed to recognize adverse reaction symptoms, observed in the office for at least 30 minutes after skin testing or treatment, and cautioned to contact the physician's office if symptoms occur. See ADVERSE REACTION, Section 3, of this instruction for information regarding adverse event reporting. All patients should have available an Emergency Anaphylaxis Kit containing epinephrine and be instructed in its use for emergency treatment of possible systemic reactions occurring at times after the patient has departed the testing or treatment premises. Immunotherapy for insect sting allergy should be given to those patients who have experienced significant systemic reactions (for detailed description of symptoms see INDICATIONS AND USAGE and ADVERSE REACTIONS) from insect stings and who demonstrate hypersensitivity by skin testing with these products. The only approved method for diagnosing insect sting allergic patients for immunization is by skin testing. This product must never be injected intravenously. Refer also to CONTRAINDICATIONS, WARNINGS, PRECAUTIONS, ADVERSE REACTIONS, and OVERDOSAGE for further discussion. Hymenoptera Venom Products available are sterile freeze-dried venom of Honey Bee (Apis mellifera) and venom protein of Yellow Jacket (Vespula sp.) and Wasp (Polistes sp.). Mixed Vespid venom protein (Yellow Jacket, Yellow Hornet and White-Faced Hornet) is also available. The reconstituted single venom products are intended for subcutaneous injection for immunotherapy and percutaneous use for diagnosis. The Mixed Vespid venom protein is for immunotherapy only, not for diagnosis. Diagnosis should be based on individual venoms. Because of the difficulty in collecting all species of Yellow Jacket and Wasp, the venom raw materials for these two insects may vary in species composition from lot to lot. A listing of the exact species content for any particular lot of Yellow Jacket or Wasp venom protein may be obtained by calling Technical Services at Jubilant HollisterStier LLC, (800) 992-1120. Final containers of sterile freeze-dried venom products are sealed under vacuum. This will result in the diluting fluid being forcibly drawn into the sealed vial when the syringe needle penetrates the seal during reconstitution. See PRECAUTIONS. When the Multidose 13.0 mL freeze-dried Honey Bee venom is reconstituted with 13.0 mL of fluid, the resulting solution will contain 100 micrograms of venom protein per mL (100 µg/mL) plus 7.7 milligrams of mannitol per mL and trace amounts of sodium chloride. When Multidose 13.0 mL freeze-dried Yellow Jacket and Wasp venom proteins are reconstituted with 13.0 mL of fluid, the resulting solution will contain 100 micrograms of venom protein per mL (100 µg/mL) plus 7.7 milligrams of mannitol per mL and trace amounts of sodium chloride, potassium chloride, acetic acid and beta-alanine. When the Multidose 13.0 mL Mixed Vespid protein is reconstituted with 13.0 mL of fluid, the resulting solution contains 300 micrograms of venom protein per mL (300 µg/mL) plus 23.1 milligrams of mannitol per mL and trace amounts of sodium chloride, potassium chloride, acetic acid and beta-alanine. Mannitol is used as an excipient. These freeze-dried products can be reconstituted in Sterile Albumin Saline with Phenol (which contains 0.9% NaCl, 0.4% phenol and 0.03% Normal Human Serum Albumin to a concentration of 100 µg/mL (300 µg/mL for Mixed Vespid venom protein). Dilutions of this concentration should be made only with Sterile Albumin-Saline with Phenol (0.4%). See DOSAGE AND ADMINISTRATION for details of dilutions for diagnosis and treatment. Space is provided on the container label to record the date (month, day, year) venom is reconstituted. Refer to dating period shown under PRECAUTIONS. At the time of reconstitution, write the calculated reconstituted product expiration date (month, day, year) on the vial label in the space provided. Diluted solutions of stinging insect venom injected intradermally will produce wheal and erythema reactions in patients who have significant IgE-mediated, Type I immediate hypersensitivity to stings of these insects. The mechanism by which hyposensitization is achieved is not known completely. IgG antibodies (blocking antibodies) appear in the serum of patients treated with injected venom. No direct relationship has been identified between the level of blocking antibody (or the ratio of blocking antibody to IgE antibody directed to the same venom antigens) and the degree of hyposensitization. However, patients who show protection from symptoms after stings have been found to have significant levels of specific blocking antibody. (3, 4) . It is not known if skin-sensitizing antibody can be eradicated or if the patient can be entirely cured, nor is it known how long immunotherapy must be continued. In a clinical study with Jubilant HollisterStier venom products, injections (using the Suggested Dose Schedule under DOSAGE AND ADMINISTRATION) were given once per week at one study center, and twice or more per week at another center. (4) (For further discussion, see below). It must be considered important to achieve the 100 µg per venom maintenance dose (the maintenance dose for Mixed Vespid venom protein is 300 µg), since there are no data on effectiveness of maintenance levels below 100 µg per venom. In the clinical trial, 97% of patients at the maintenance dosage (100 µg per venom) showed no systemic reaction following an insect sting challenge. (4)The remaining 3% had a milder reaction than noted prior to treatment. The patients in this study reached maintenance (100 µg per venom) usually within 2 1/2-3 1/2 months after beginning therapy. (4) Whether efficacy of therapy is influenced by the time required to reach maintenance has not yet been determined. In deciding the criteria for proceeding from dose to dose of the Suggested Dose Schedule (see DOSAGE AND ADMINISTRATION), the results of the clinical study(4) should be considered. A study center "A" reporting the least number of systemic reactions during pre-maintenance treatment held the dose constant in most of the cases where significant local reactions occurred. With the systemic reactions reported, this center held the dose the same in approximately 80% of the incidences. The treatment injections were given at this center usually once per week, and if a patient missed an appointment, the next dose was often the same as the preceding dose (depending on the previous reactivity of the patient). Patients treated at this center reached maintenance in an average of 17-19 visits. Another study center "B", reporting a higher incidence of systemic reactions, was more regimented in following the Suggested Dose Schedule. This center reduced or held the dose the same in less than 10% of the cases reporting significant local reactions. With the systemic reactions reported, this center held the dose the same or reduced the dosage in approximately 20% of the cases. At this center, more than one injection per week was given at the outset as circumstances and sensitivity allowed. Patients treated at this center reached maintenance in an average of 14 visits. Insect stings may induce a wide range of allergic symptoms in sensitive patients. A normal sting response is initial burning or stinging pain that may be intense and last several minutes to an hour or more. There is usually some local swelling coming on immediately and persisting for several days. The location of the sting has considerable influence on the intensity of the pain and extent of swelling. Stings on the fingers or feet produce much pain, but less swelling; whereas a sting on the head or face produces extensive swelling with variable pain. Rarely, other types of severe reactions to insect stings have been reported. (6) These include serum sickness, hematologic abnormalities, and neurological disorders commencing some time after a sting, and not associated with anaphylactoid reactions. These patients are not candidates for immunotherapy using insect venoms. Another study demonstrated false positive reactions when skin testing with venom concentrations of 10 µg/mL and 100 µg/mL was carried out. (8) Thus there can be a nonspecific skin test reaction potentially due to the pharmacological action of the venom at higher concentrations. The best statement that can be made, at present, is that patients with significant positive history (reactions of the three types described above) following an insect sting, and who do react with a positive skin test to a venom concentration of 1 µg/mL or less, are recommended for treatment. Patients who have the history described above, but who do not react to a 1 µg/mL intradermal venom skin test, cannot be recommended for treatment. At present, the data does not exist, to determine whether a patient who might react to a higher concentration, e.g., 2-10 µg/mL, is at risk from a subsequent sting or not. Since it is not known if sting-sensitive patients who subsequently lose their IgE anti-venom antibody can be resensitized by further stings, it is advisable to retest these patients after any subsequent stings. (3) However, since the level of venom-specific IgE may fall to low levels briefly after a sting, patients should not be re-tested until 2 to 4 weeks after any sting. Immunotherapy is indicated for those patients diagnosed as sensitive (see Diagnosis above) and is accomplished by using graduated dilutions of the appropriate insect venom or venoms to control the severity of the patient's symptoms from subsequent stings. Increasing doses of venom are given at intervals, dependent on the patient's ability to tolerate the venoms, until a maintenance dosage (100 µg per venom is recommended - 300 µg in the case of the Mixed Vespid venom protein) is reached and maintained. Venom sensitivity differs for individual patients, thus it is not possible to provide a dosage schedule that is universally suited to all patients. The dosage schedule shown under DOSAGE AND ADMINISTRATION is a summary of the schedule used in clinical trials of our product and found suitable for the majority of patients. In highly sensitive patients, the physician may be required to use a modified dose schedule, based on the patient's sensitivity to and tolerance of the injections. Lower initial doses and smaller dosage increments than shown under DOSAGE AND ADMINISTRATION may be necessary. There are no known absolute contraindications to immunotherapy using Hymenoptera Venom Products. See also PRECAUTIONS and WARNINGS. Patients showing negative intradermal skin tests to specific venoms at 1 µg/mL are not recommended for venom treatment. Any injections, including immunotherapy, should be avoided in patients with a bleeding tendency. Since there are differences of opinion concerning the possibility of routine immunizations exacerbating autoimmune diseases, immunotherapy should be given cautiously to patients with other immunologic diseases and only if the risk from insect stings is greater than the risk of exacerbating the underlying disorder. See WARNINGS box at the beginning of this Instruction Sheet. See also PRECAUTIONS. Venom extract must be temporarily withheld from patients or the dose adjusted downward if any of the following conditions exist: (1) severe symptoms of rhinitis and/or asthma; (2) infection or flu accompanied by fever; (3) any evidence of an excessively large local or any generalized reaction during the initial stages of immunotherapy, or during maintenance therapy; and/or (4) insect sting prior to a scheduled injection. Do not administer venom injections during a period of symptoms following an insect sting or on the day the patient received an insect sting, since this could result in an allergen load that exceeds the patient's tolerance. THE CONCENTRATE MUST NOT BE INJECTED AT ANY TIME UNLESS TOLERANCE HAS BEEN ESTABLISHED. DILUTE CONCENTRATED EXTRACTS WITH STERILE ALBUMIN SALINE WITH PHENOL (0.4%) FOR SKIN TESTING AND IMMUNOTHERAPY. INJECTIONS MUST NEVER BE GIVEN INTRAVENOUSLY. Subcutaneous injection is recommended. Intracutaneous or intramuscular injections may produce large local reactions or be excessively painful. AFTER INSERTING NEEDLE SUBCUTANEOUSLY, BUT BEFORE INJECTING, ALWAYS WITHDRAW THE PLUNGER SLIGHTLY. IF BLOOD APPEARS IN THE SYRINGE, CHANGE NEEDLE AND GIVE THE INJECTION IN ANOTHER SITE. IF CHANGING TO A DIFFERENT LOT OR A FRESHLY RECONSTITUTED VIAL OF VENOM EXTRACT: All extracts lose potency over time, and a fresh extract could have an effective potency that is substantially greater than that of the old extract. The first dose from the new vial should not exceed 50% of the previous dose. IF THE VENOM EXTRACT PREVIOUSLY USED WAS FROM ANOTHER MANUFACTURER: Since manufacturing processes and sources of raw materials differ among manufacturers, the interchangeability of extracts from different manufacturers cannot be ensured. The starting dose of the venom extract therefore should be greatly decreased even though the extract is the same formula and dilution. In general, a dose reduction to 50% of the previous product dose should be adequate, but each situation must be evaluated separately considering the patient's history of sensitivity, tolerance of previous injections, and other factors. If the patient tolerates a 50% decrease, the next dose could be raised to the previous dose amount. If the decrease is greater than 50%, the next dose would need to be determined by the allergist, depending on the situation. Dose intervals should not exceed one week when rebuilding dose. SeeDOSAGE AND ADMINISTRATION. IF A PROLONGED PERIOD OF TIME HAS ELAPSED SINCE THE LAST INJECTION: Patients may lose tolerance for allergen injections during prolonged periods between doses. The duration of tolerance is an individual characteristic and varies from patient to patient. In general, the longer the lapse in the injection schedule, the greater dose reduction required. If the interval since last dose is over four weeks, perform skin tests to determine starting dose. See DOSAGE AND ADMINISTRATION. IF THE PREVIOUS EXTRACT WAS OUTDATED: The dating period for allergenic extracts indicates the time that they can be expected to remain potent under refrigerated storage conditions (2° - 8°C). During the storage of extracts, even under ideal conditions, some loss of potency occurs. For this reason, extracts should not be used beyond their expiration date. If a patient has been receiving injections of an outdated extract, s/he may experience excessive local or systemic reactions when changed to a new, and possibly more potent extract. In general, the longer the material has been outdated, the greater the dose reduction necessary when starting the fresh extract. Proper selection of the dose and careful injection should prevent most systemic reactions. It must be remembered, however, that allergenic extracts are highly potent in sensitive individuals and that systemic reactions of varying degrees of severity may occur, ranging from mild to life-threatening anaphylaxis, or even death, as described under INDICATIONS AND USAGE and ADVERSE REACTIONS. Patients should be informed of this, and the warnings and precautions should be discussed prior to immunotherapy. See PRECAUTIONS below. Systemic reactions should be treated as indicated in ADVERSE REACTIONS. Concentrated extracts must not be injected unless tolerance has been established. Diluting fluid should be forcibly drawn into the sealed vial when the syringe needle penetrates the seal during reconstitution. Failure of this to occur for a particular vial indicates possible loss of vacuum. Vials without vacuum should be returned to the manufacturer. Record date of reconstitution and expiration date of reconstituted product in the space provided on the product label. Date of expiration after reconstitution must not exceed the Final Expiration Date indicated on the container label. (See table below for expiration dates, including dilutions). Store freeze-dried and reconstituted venom stock solutions and dilutions constantly at 2° - 8°C. Sterile solutions, vials, syringes, etc., should be used and aseptic precautions observed in making dilutions. To avoid cross-contamination, do not use the same needle to withdraw materials from vials of more than one extract, or extract followed by diluent. A sterile tuberculin syringe, with a needle at least 5/8" long and graduated in 0.01 mL units, should be used to measure carefully each dose from the appropriate dilution. Aseptic techniques should always be employed when injections are being administered. A separate sterile syringe should be used for each patient to prevent transmission of hepatitis and other infectious agents from one person to another. Patient reactions to previous injections should be reviewed before each new injection so that dose can be adjusted accordingly. See ADVERSE REACTIONS and WARNINGS. Rarely, a patient is encountered who develops systemic reactions to minute doses of allergen and does not demonstrate increasing tolerance to injections after several months of treatment. It is suggested that if systemic reactions or excessive local responses occur persistently at very small doses, efforts at immunotherapy should be stopped. PATIENTS SHOULD BE OBSERVED IN THE OFFICE FOR AT LEAST 30 MINUTES AFTER SKIN TESTING AND AFTER EACH TREATMENT INJECTION. Most severe reactions will occur within this time period, and rapid treatment measures should be instituted. See ADVERSE REACTIONS for such treatment measures. Patients should be instructed in the recognition of adverse reactions to immunotherapy, and in particular, to the symptoms of shock. (See WARNINGS box at the beginning of this Instruction Sheet). Patients should be made to understand the importance of a 30 minute observation period following skin testing or therapeutic injections, and be cautioned to return to the office promptly if symptoms occur after leaving. Patients should be instructed in the use of, and have available, an Emergency Anaphylaxis Kit for self-administration of epinephrine. Patients must be instructed to report any insect stings that have occurred, since a venom injection should not be given on the same day as the sting, nor during a time when the patient is still experiencing symptoms from the sting. See WARNINGS section regarding concurrent treatment with ACE inhibitors. When using other drugs in patients receiving allergenic extracts, always consult the product labeling of the other drugs to determine any possible interaction with use of allergenic extracts, and specifically with stinging insect (Hymenoptera) venom extracts. Long-term studies in animals have not been conducted with allergenic extracts to determine their potential for carcinogenicity, mutagenicity, or impairment of fertility. Animal reproduction studies have not been conducted with Hymenoptera Venom Products. It is also not known whether Hymenoptera Venom Products can cause fetal harm when administered to a pregnant woman or can affect reproduction capacity. Hymenoptera Venom Products should be given to a pregnant woman only if clearly needed. On the basis of histamine's known ability to contract uterine muscle, theoretically, a systemic reaction, whether occurring from insect sting or from venom skin testing or treatment dose, should be avoided. (3) Therefore, the physician must carefully consider the benefit-to-risk ratio, to both patient and fetus, of continuing venom immunotherapy during pregnancy, or performing venom skin testing, and especially of initiating a venom immunotherapy program where there is a possibility that the patient may not be able to reach the recommended maintenance dose without significant risk of a systemic reaction. Physicians administering Hymenoptera Venom testing or treatment materials should be experienced in the treatment of severe systemic reactions (see WARNINGS box at the beginning of this Instruction Sheet). See CLINICAL PHARMACOLOGY and DOSAGE AND ADMINISTRATION Sections. A mild burning immediately after the injection is to be expected. This usually leaves in 10 to 20 seconds. See also WARNINGS and PRECAUTIONS regarding proper method and route of injection. Most severe systemic reactions usually will begin within a 30-minute time period, but systemic reactions may occur at any time after skin tests or immunotherapy. Symptoms may range from mild to life-threatening from anaphylaxis as described under INDICATIONS AND USAGE. With careful attention to dosage and administration, severe systemic reactions occur infrequently, but it cannot be overemphasized that in sensitive individuals, any injection could result in anaphylactic shock. Therefore, it is imperative that physicians administering allergenic extracts understand and be prepared for the treatment of severe reactions. See CLINICAL PHARMACOLOGY for clinical incidence of systemic reactions and course of action following these reactions. If a systemic or anaphylactic reaction does occur, inject 1:1000 epinephrine-hydrochloride intramuscularly or subcutaneously. ADULT: 0.3 to 0.5 mL should be injected. Repeat in 5 to 10 minutes if necessary. PEDIATRIC: The usual initial dose is 0.01 mg (mL) per kg body weight or 0.3 mg (mL) per square meter of body surface area. Suggested dosage for infants to 2 years of age is 0.05 mL to 0.1 mL; for children 2 to 6 years, 0.15 mL; and children 6 to 12 years, 0.2 mL. Single pediatric doses should not exceed 0.3 mg (mL). Doses may be repeated as frequently as every 20 minutes, depending on the severity of the condition and the response of the patient. After administration of epinephrine, profound shock or vasomotor collapse should be treated with intravenous fluids, and possibly vasoactive drugs. Airway patency should be ensured. Oxygen should be given by mask. Intravenous antihistamines, inhaled bronchodilators, theophylline and/or corticosteroids may be used if necessary after adequate epinephrine and circulatory support have been given. Emergency resuscitation measures and personnel trained in their use must be available immediately in the event of a serious systemic or anaphylactic reaction not responsive to the above measures [Ref. J. Allergy and Clinical Immunology, 77(2): p.271-273, 1986]. Rarely are all of the above measures necessary; epinephrine usually produces a prompt response. However, the physician should be prepared in advance for all contingencies. Promptness in beginning emergency treatment measures is of utmost importance. For recommendations regarding how to proceed with venom extract dose following systemic reactions, see WARNINGS, PRECAUTIONS and DOSAGE AND ADMINISTRATION. Report all adverse events to Jubilant HollisterStier LLC Customer Technical Services Department at 1(800) 992-1120. A voluntary adverse event reporting system for health professionals is available through the FDA MEDWATCH program. Preprinted forms (FDA Form 3500) are available from the FDA by calling 1(800) FDA-1088. 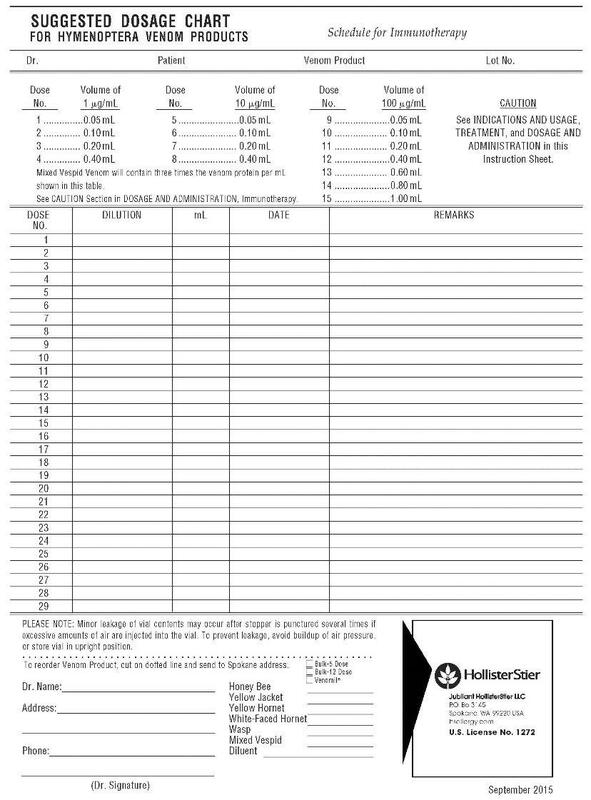 Completed forms should be mailed to MEDWATCH, 5600 Fisher Lane, Rockville, MD 20852-9787 or Fax to: 1(800) FDA-0178. Reconstitute and dilute the freeze-dried venom as directed below. Sterile Albumin Saline with Phenol (0.4%) must be used to reconstitute and dilute the venoms for skin testing and treatment. Reconstitute the freeze-dried venoms by adding 13.0 mL Sterile Albumin Saline with Phenol (0.4%) to the vial using a sterile syringe. Swirl or rock the container to dissolve the venom completely. DO NOT SHAKE, since shaking can cause foaming. Dilutions (see table below) must be made in Sterile Albumin Saline with Phenol (0.4%). They must be made accurately and aseptically, using sterile solutions, vials, syringes, etc., and thoroughly mixed by rocking or swirling. DO NOT SHAKE. Store freeze-dried and reconstituted venom product, and venom dilutions constantly at 2° - 8°C. NOTE: Mixed Vespid venom protein concentrations will be three times that shown above. Since the level of insect venom specific IgE may fall to low levels briefly after a reaction to a sting, patients should not be tested until 2 to 4 weeks after any sting. Skin testing should be carried out with all five individual venoms, since many patients have multiple sensitivities. (4) Mixed Vespid venom protein should be used only for therapy - not for diagnosis. Prick testing should be done before intradermal testing to determine appropriate concentration for intradermal testing. See Intradermal Tests below. Skin testing (prick and intradermal) provides information to assist in identifying those patients who are to be classified as extremely sensitive and who may not tolerate the Suggested Dose Schedule. See DOSAGE AND ADMINISTRATION, Immunotherapy CAUTION. In both the prick and intradermal tests, a negative control test with diluent alone must be performed. A histamine positive control test is also recommended. The flexor surface of the forearm is the usual location for skin testing. It is important that a separate sterile syringe and needle be used for each extract and each patient. Prick Tests: Prick tests are accomplished by applying one drop of the 1 µg/mL venom protein solution to the forearm, and by pricking the skin through the surface of the drop with a sterile 27 gauge needle. The prick is superficial and should not draw blood. Skin response should be assessed after approximately 15-20 minutes. For prick tests, a positive reaction (reaction greater than diluent control) at the 1 µg/mL concentration indicates a high level of sensitivity to the test venom. Intradermal Tests: Patients showing a positive reaction to the prick test at the 1 µg/mL concentration should begin intradermal tests at concentrations of not more than 0.0001 to 0.001 µg/mL. Patients with negative prick tests may begin intradermal tests at a concentration of 0.001 µg/mL. A 1 mL tuberculin syringe with a short 27-gauge needle should be used to deliver a volume of 0.05 mL for intradermal testing. Introduce the needle into the superficial skin layers, bevel down, until the bevel is completely buried, then slowly inject a 0.05 mL aliquot of the venom dilution, making a small bleb. Start intradermal tests with the most dilute solution. If after 20 minutes no skin reaction is obtained, continue the intradermal testing using ten-fold increments in the concentration until a reaction of 5-10 mm wheal and 11-20 mm erythema is obtained, or until concentration of 1 µg/mL has been tested, whichever occurs first. A patient should be considered sensitive to the test venom when a skin response of 5-10 mm wheal and 11-20 mm erythema (or greater) occurs at a concentration of 1 µg/mL or less,(8) providing that this reaction is greater than that of the diluent control. For proper method and route of injection, see WARNINGS, PRECAUTIONS and ADVERSE REACTIONS. The most common site of injection is the lateral aspect of the upper arm. Patients who have multiple venom sensitivities should be given each specific venom injection in a separate site. (Except, if the patient has sensitivities to Yellow Jacket, Yellow Hornet, and White-Faced Hornet venoms concurrently, s/he can be injected with Mixed Vespid venom protein, an equal mixture of these three vespid venoms). Note which venom preparation is injected at a specific site, so that dosage of that venom preparation can be adjusted if an excessive local reaction occurs. In patients receiving more than one venom, there is theoretically a greater risk of systemic reactions. CAUTION: Sensitivity to venom differs from patient to patient. Thus, it is not possible to provide a dosage schedule suitable for all patients. The Suggested Dose Schedule shown below was used in clinical trials (4) and should be suitable for a majority of patients. IN EXTREMELY SENSITIVE PATIENTS, however, an individualized dose schedule must be employed which will be dictated by the patient's sensitivity. This individualized schedule will probably include weaker dilutions and smaller increments between doses in progressing to the maintenance level (100 µg per venom). In identifying those patients to be classified as extremely sensitive, individuals reacting with significant skin test (wheal greater than 5 mm and erythema greater than 20 mm) at intradermal skin test concentrations of 0.01 µg/mL or less, or those patients experiencing a systemic reaction to any venom skin test concentration, should be considered highly sensitive. per mL show in this table. In proceeding with the Suggested Dose Schedule, or modified schedules (for highly sensitive patients) it is recommended that injections be given at least once per week, as in the clinical studies. (SeeCLINICAL PHARMACOLOGY and INDICATIONS AND USAGE). When building the dose, it is important that dose intervals not exceed one week since longer intervals may decrease the patienttolerance of the extract. Based on the clinical studies, (4) it is suggested that if a systemic, extremely large local (10 cm or more in duration, or other severe local symptoms), or persistent and severe delayed local reaction occurs during the dose building phase, the dose at the next visit be held constant (or reduced, depending on judgment of the severity of the reaction) as was done at Study Center "A," which reported the least number of systemic reactions during the course of therapy. It must be considered important to achieve the 100 µg per venom maintenance dose (the maintenance dose for Mixed Vespid venom protein is 300 µg), since there are no data on effectiveness of maintenance levels below 100 µg per venom. Following the achievement of maintenance level (100 µg per venom), it is recommended that a second maintenance injection be given at a 1-week interval, and a third maintenance injection at a 2-week interval. Administer the next injection at a 3-week interval, and then monthly for ongoing maintenance. See CLINICAL PHARMACOLOGY and INDICATIONS AND USAGE for further information regarding clinical studies on which the above recommendations are based. The optimum duration for immunotherapy is not known, so current recommendations are that maintenance injections be continued indefinitely, year around, particularly in patients experiencing life-threatening anaphylaxis after insect stings. The dose for the pediatric population is the same as for adults. (See PRECAUTIONS). The dose for elderly patients is the same as for adult patients under 65. (23) (See PRECAUTIONS). Jubilant HollisterStier LLC sterile freeze-dried Hymenoptera Venom Products are supplied in vacuum-sealed 20 mL vials containing 1300 micrograms (1300 µg) for the single venoms, and 3900 micrograms (3900 µg) per 20 mL vial for the Mixed Vespid venom protein product. Reconstituting fluid [Sterile Albumin Saline with Phenol (0.4%)] is available separately. Storage: Store freeze-dried and reconstituted venom product, and venom dilutions, at 2° - 8°C, and keep at this temperature range during office use. A number of factors beyond our control could reduce the efficacy of this product or even result in an ill effect following its use. These include storage and handling of the product after it leaves our hands, diagnosis, dosage, method of administration and biological differences in individual patients. Because of these factors, it is important that this product be stored properly and that the directions be followed carefully during use. No warranty, express or implied, including any warranty of merchantability or fitness, is made. Representatives of the Company are not authorized to vary the terms or the contents of any printed labeling, including the package insert, for this product except by printed notice from the Company's headquarters. The prescriber and user of this product must accept the terms hereof. 1. Lockey, Richard F., Linda M. Benedict, Paul C. Turkeltaub, Samuel C. Bukantz. Fatalities from immunotherapy (IT) and skin testing (ST). J. Allergy Clin. Immunol. 79 (4): 660-677, 1987. 2. Jacobs, Robert L., Goeffrey W. Rake, Jr., et. al. Potentiated anaphylaxis in patients with drug-induced beta-adrenergic blockade. J. Allergy Clin. Immunol. 68 (2): 125-127, August 1981. 3. Hunt, K. J., M. D. Valentine, A. K. Sobotka, A. W. Benton, F. J. Amodio, L. M. Lichtenstein. A controlled trial of immunotherapy in insect hypersensitivity. New Eng. J. Med. 299: 157-161, July 27, 1978. 4. Summary of data from BB-IND 1292 clinical studies, 1978-79, on Hollister-Stier products. 5. Amodio, F., L. Markley, M. D. Valentine, A. K. Sobotka, L. M. Lichtenstein. Maintenance immunotherapy for Hymenoptera sensitivity. J. Allergy Clin. Immunol. 61 (3): 134, 1978. 6. Reisman, R. E., Allergy Principles and Practice. E. Middleton, C. E. Reed, E. F. Ellis, ed. C. V. Mosby Co., 1978. 7. Sobotka, A. K., N. F. Adkinson, Jr., M. D. Valentine, L. M. Lichtenstein. Allergy to insect stings. IV. Diagnosis by R.A.S.T. J. Immunol. 121 (6): 2477-2484, 1978. 8. Hunt, K. J., M. D. Valentine, A. K. Sobotka, L. M. Lichtenstein. Diagnosis of allergy to stinging insects by skin testing with Hymenoptera venoms. Annals Int. Med. 85: 56-59, 1976. 9. Annals of Allergy, Asthma and Immunology. Inhibitors of angiotensin II: Potential hazards for patients at risk for anaphylaxis. Editorial. 78: 527-529, June 1997. 10. Pharm. Ind. (Germany). Anaphylactoid reactions in patients treated with ACE inhibitor treatment in combination with desensitization treatment or after insect bites. 56 (9): IX226-227, 1994. 11. Tunon-De-Lara, J. M., et al. ACE inhibitors and anaphylactoid reactions during venom immunotherapy. The Lancet (United Kingdom). 340 (8824): 908, Oct. 10, 1992. 12. Weinstien, A. M., B. D. Dubin, W. K. Podleski, S. L. Spector, R. S. Farr. Asthma and pregnancy. JAMA. 124 (11): 1161-1165, 1979. 13. Reid, M. J., R. F. Lockey, P. C. Turkletaub, T. A. E. Platts-Mills. Survey of fatalities from skin testing and immunotherapy. J. Allergy Clin. Immunol. 92 (1): 6-15, July 1993. 14. Reid, M. J., G. Gurka. Deaths associated with skin testing and immunotherapy. J. Allergy Clin. Immunol. 97 (1) Part 3:231, Abstract 195, January 1996. 15. Thompson, R. A. et al. Report of a WHO/IUIS working group. The current status of allergen immunotherapy (hyposensitization). Allergy. 44: 369-379, 1989. 16. Malling, H.J., B. Weeke, et al. The European Academy of Allergology and Clinical Immunology. Position Papers. Allergy. 48 (Supplement 14): 9-82, 1993. 17. Pipkorn, Ulf. Pharmacological influence of anti-allergic medication on In Vivo allergen testing. Allergy. 43: 81-86, 1988. 18. Andersson, M. U. Pipkorn. Inhibition of the dermal immediate allergic reaction through prolonged treatment with topical glucocorticosteroids. J. Allergy Clin. Immunol. 79 (2): 345-349, February 1987. 19. Rao, Kamineni S., et al. Duration of suppressive effect of tricyclic anti-depressants on histamine induced wheal and flare reactions on human skin. J. Allergy Clin. Immunol. 82: 752-757, November 1988. 20. Pipkorn, Ulf, M. Andersson. Topical dermal anesthesia inhibits the flare but not the wheal response to allergen and histamine in the skin prick test. Clinical Allergy. 17: 307-311, 1987. 21. DuBuske, L. M., C. J. Ling, A. L. Sheffer. Special problems regarding allergy immunotherapy. Immunol. Allergy Clin. North Am. (USA). 12 (1): 145-175, 1992. 22. Graft, D., K. Schuberth, A. Kagey-Sobotka, K. Kwiterovich, Y. Niv, L. Lichtenstein, M. Valentine. Assessment of prolonged venom immunotherapy in children. J. Allergy Clin. Immunol. 80 (2): 162-169, August 1987. 23. Peebles, Ray Stokes, Jr., B. Bochner, Howard J. Zeitz, ed. Anaphylaxis in the elderly. Immunol. Allergy Clin. of North Am. 13 (3): 627-646, August 1993.